Tom Chaplin (vocals), Richard Hughes (drums), and Tim Rice-Oxley (piano) are childhood friends from Battle, East Sussex, England, and together they make the merry pop sounds of Keane. 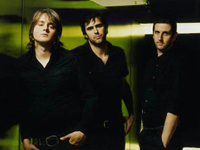 Formed in 1997 while each were attending college, Keane initially started out as a cover band. They played Oasis, U2, and The Beatles songs in and around East Sussex with guitarist Dominic Scott. The shtick would only last so long, for the band got tired of playing everyone else’s songs and yearned to do things on their own. When Chaplin left his art history studies at Edinburgh University behind in 1999, and moved to London to join the rest of his mates, Keane had a chance to really do it. Keane began writing and recording almost immediately. Call Me What You Like marked their self-released debut single in early 2000, and Wolf at the Door followed a year later; however, things were slow to develop. Scott left the band in July 2001 and labels weren’t really biting at Keane’s rich, piano-driven kind of rock because Coldplay supposedly was doing it. In December 2002, Keane got the break they’d been waiting for. Fierce Panda’s Simon Williams was summoned by a friend to attend a Keane gig in London. Williams was so impressed by the band’s performance, he offered to issue the band’s next single, Everybody’s Changing, on the spot. The limited-edition release was such a success on radio that several labels soon swarmed around the indie rock trio, eager to offer them a recording contract.